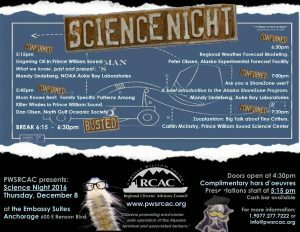 On Thursday, December 6, the Council will host our annual Science Night at the Embassy Suites in Anchorage (600 E Benson Blvd). Hear about the latest research that affects the safe transportation of oil through Prince William Sound. This event is an initiative of the Council’s Scientific Advisory Committee. SAC, as it’s known, ensures Council projects are based on the best science. Doors open at 4:30pm, and presentations start at 5:15pm. For a full list of speakers, featured topics, and presentation times please download the Science Night flyer (updated November 29). For more information: 907-277-7222 or info@pwsrcac.org. 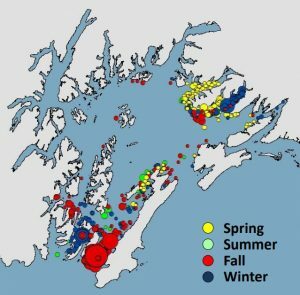 Where humpback whales hang out in Prince William Sound, by season. Image from “We are watching” presentation by Mandy Lindeberg. The Council had some great presentations at our recent Science Night! See the list below for the presenter’s slides. Want to get notifications for next year’s event? Email Shawna Popovici to be added to the list! The council held our annual Science Night on Thursday, December 8. Presentations by scientists conducting research into areas of council interest are highlighted. This post has been updated with links to presentations. See below. UPDATED (Dec 8): All presentations are now available for download. Please see the links below. Science it up with us! 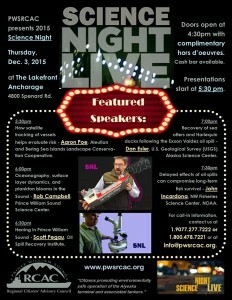 On Thursday, December 3, the council is hosting our annual Science Night at The Lakefront Anchorage (formerly The Millenium). Hear about the latest research that affects the safe transportation of oil through Prince William Sound.